Today I'm very pleased to introduce you to Nancy Volkers, author of A Scottish Ferry Tale and Scotland by Starlight. I read both books recently, and enjoyed them immensely. 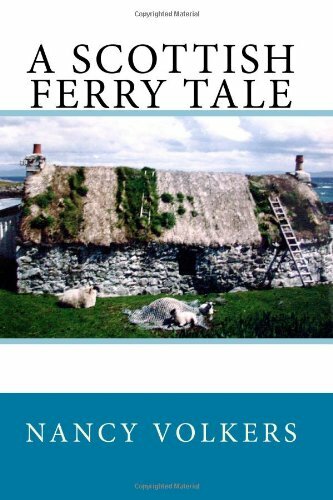 In fact, A Scottish Ferry Tale is one of my favorite books so far in 2012. The main characters, Cassie and Ralph, will stick with me for a very long time. As a romance junkie, I was curious why Ms Volkers chose to write romance, and she's here to talk to us about that very subject. Thanks, Marie, for giving me space on your blog to ramble on. ;-) Marie asked me to focus on why I write romance. I am fascinated with relationships. Plenty of relationships don’t involve romance, of course, but romantic relationships are so mysterious and multifaceted…there’s a lot to think about. Why are we attracted to certain people, and put off by others? How do we express our attraction? What are we afraid of in a relationship? There’s always something that we’re afraid of, even if we don’t admit it. Showing our “true self” and being rejected…losing hard-won independence…getting taken advantage of. The romance novels that I’ve enjoyed reading have given me a window into an intimate dance between two people that we’re not afforded in real life. In a novel, you “watch” people interact with one another in very private situations. Sometimes I look at a couple on the street and wonder what they’re like with one another in private. That stodgy, analytical couple could be snuggly and sweet when no one else can see them; likewise, that affectionate, bordering-on-disgusting couple that calls one another “Pookie” in public might be putting on an act. Maybe when they get home at night, they avoid one another. You just never know. 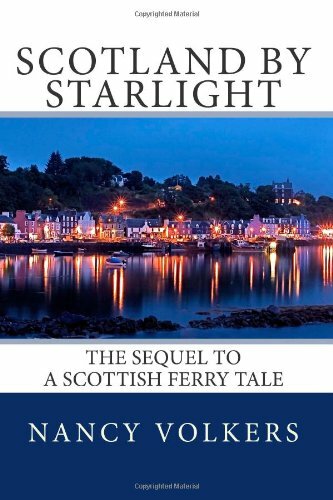 The romance between Cassie and Ralph is the main relationship in A Scottish Ferry Tale and Scotland by Starlight, but there are many other relationships as well. Cassie and Jason. Ralph and April. Cassie and her sister, Rachel. Ralph and his four sisters. Ralph and Jamie, Jamie and Lynn, Cassie and Leslie, Leslie and Rose, Ralph and Tenney, and on and on…for me, there would be no books without these relationships. Some writers focus on action, or plot, or mystery; I focus on characters. So romance, I guess, is a natural fit. Nancy is a writer/editor/website manager who has lived in Vermont since 2003. She grew up in Western New York State and went to Drew University (N.J.), Stanford University (Calif.), and the University of Minnesota (um, Minn.), accumulating two degrees and an incredible store of knowledge, most of which fell out of her head right after the test. Nancy has written two novels, A Scottish Ferry Tale and Scotland by Starlight. She's working on some others. She rarely dusts anything. We all have rules that we use to get through life. You always put your right sock on first. You refuse to buy generic cream cheese. You don’t date anyone named Wayne. Cassie Wrentham has a book of these rules, and they suit her fine. Until she flies to Scotland to visit her boyfriend and he dumps her the first night. Cassie doesn’t run back to the United States. She goes to Coll, a tiny island off the west coast, hoping to find the answers to life’s questions on a wind-washed beach or at the end of a rock-strewn road. Instead, she may have found the love of her life… if she can get past her own self-doubt, skepticism and inner conflict. Cassie Wrentham is on her way to Scotland again... but this time it's not vacation. She's moving in with Ralph Macnair, the charismatic Scotsman who stole her heart. But Cassie wouldn't be Cassie without doubts. Will she find a job in a tight U.K. economy? Would marrying Ralph now be only for convenience's sake? Will she fit in, make friends, make a life there? Or will it all fall apart? Bursting with a lively cast of characters, all with their own stories and challenges, Scotland By Starlight follows Cassie and Ralph from the new beginnings of their intense relationship to a conclusion like no other. Love the guest post Nancy!